Greenland's ice-covered fjords are the connections between the Greenland Ice Sheet and the open ocean. These dynamic environments enable outlet glaciers to access warm ocean water, causing large amounts of melting under floating tongues. 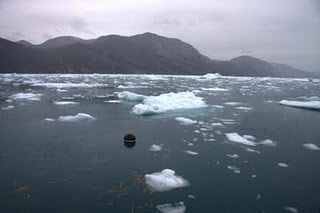 On the other hand, deep fjords also enable ice to break up mechanically through the process of calving. These icebergs are then transported away from the glaciers, where they eventually melt. The interactions between the ocean, its ice cover (the melange), the glacier ice, and the atmosphere remain poorly understood, mostly due to the extremely difficult conditions for direct observations. The principal purpose of this project is to demonstrate the feasibility of instrumenting heavily ice-covered fjords to obtain real-time data of the upper ocean. 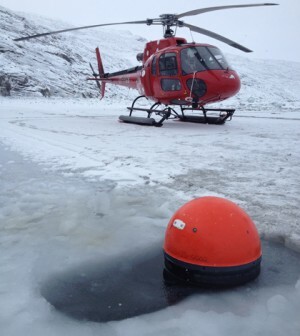 The surface float of a deployed drifter surrounded by ice. This project is a collaboration between our school (the School of Fisheries and Ocean Sciences, UAF), the Geological Institute at UAF (Martin Truffer, Principal Investigator), and the Greenland Climate Research Center (GCRC). Hauri, C., M. Truffer, P. Winsor and K. Lennert (2014), Surface Drifters Track the Fate of Greenland Ice Sheet Meltwater, Eos Trans. AGU, 95(26), 237.
copyright © 2010 art lab | Last modified: April 25 2018 00:12:51.